The hamlet of Huacachina lies among giant dunes in the arid region south of Lima. An underground spring feeds a small lagoon which is surrounded by the village. It is an oasis of green in the mountainous waves of sand which has become a favourite stop on the “Gringo Trail” of Peru. 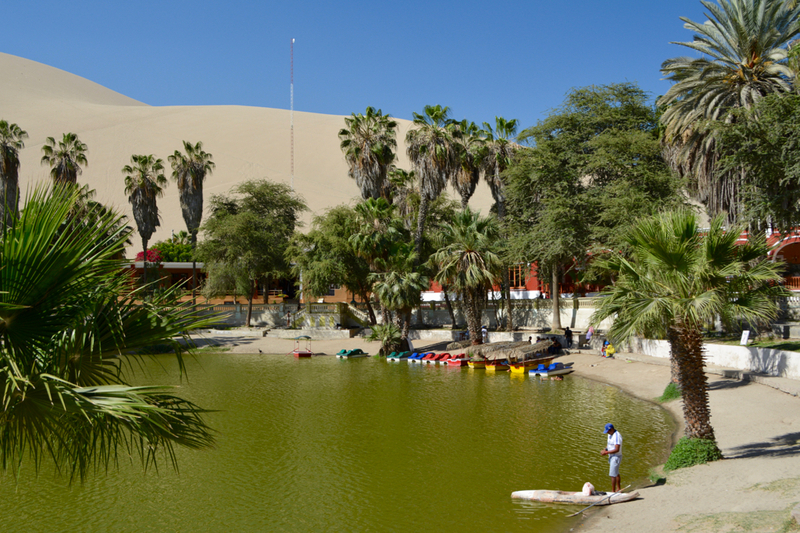 The Huacachina desert oasis and surrounding dunes. Small hotels, hostels, gift shops and restaurants are the backbone of commerce in Huacachina providing the continuous flow of tourists with services they require. The main attraction is the thrilling rides in the sand dunes in a motorised buggy and sandboarding. It’s a roller coaster feeling riding the sand waves in a dune buggy. For the athletically challenged, sand-sledding is an alternative option. The late afternoon excursion tours conclude watching the sun set over the unique landscape. The days are warm and sunny and the evenings fresh and breezy, a perfect place to recharge your batteries poolside, have some fun and get a good nights sleep. Our relaxing hostel’s backyard hideout. Looks like a lovely place for a visit. Peru is on our list so I will keep this in mind. Thanks! Lucky for us the Dune Buggy carted us to the next downhill run. No fun climbing sand dunes but it is good exercise.